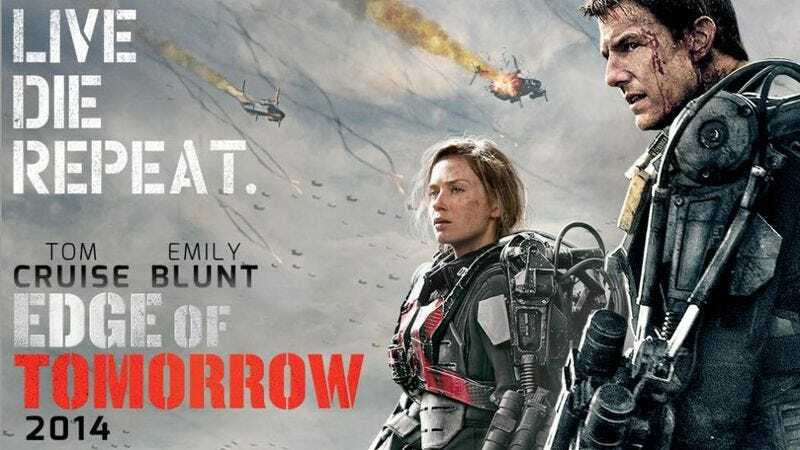 Edge Of Tomorrow was a fun summer blockbuster with a stealth bomber of a title, constantly slipping away from the searching radar of memory. You’d be excused for thinking the movie was called “Tom Cruise Groundhog-Day-with-guns,” since every conversation about it inevitably focused on the premise and not the name—a name we can now no longer remember. Wait, give us a second to look at the top of this paragraph. Okay, Edge Of Tomorrow, got it. Apparently Warner Brother’s marketing department agrees, because the DVD and Blu-ray packaging for… that movie… dramatically downplays the original title in favor of the film’s tagline, Live. Die. Repeat. That phrase, besides having a certain memory-grabbing urgency, also has the benefit of describing things that actually happen in the movie. And so it now appears in giant letters on the cover, with the film’s original title, *cough*, shoved down to the bottom of the box and smushed into what looks like a single word. Both titles appear on the spine of the DVD/Blu-ray case and on iTunes, which now calls the film Live Die Repeat: Edge Of Tomorrow. Perhaps none of this would have been necessary if they’d stuck with the original name, All You Need Is Kill.